Modern plastic heaters with thermoregulation. Exceptionally resistant to mechanical damage. Its flat shape allows for unhindered installation on any aquarium wall. It can also operate installed horizontally – ideal solution for aquaterrariums with turtles. EASYHEATER is a technologically advanced device whose housing is made of special composite plastic. This makes the heater unbreakable and highly resistant even to strong impacts. The device is also noticeable for its functional shape: it is flat, thin and small in size, which means that it can be easily made inconspicuous in an aquarium. Thanks to the handy double hanger, the heater can be mounted on any of the aquarium walls. The freedom of installation is further increased by the fact that EASYHEATER can operate in any position, horizontal as well as vertical. You can precisely set the desired temperature by means of a large ergonomic dial with an expanded temperature scale ranging from 17 to 36º C. The accuracy of the automatic thermostat is within ± 1° C. The operation of the heater is signalled by three LEDs on the top and front of the housing. The LEDs are automatically switched on at the start of a heating cycle, allowing you to monitor the device. EASYHEATER is equipped with a thermal safety switch. It is intended to prevent the device from breaking down or causing a fire hazard in the event of the heater being accidentally switched on when out of water or if there is an uncontrolled water leakage from the tank. In a situation like that, the thermal safety switch will turn the heater off automatically. After the heater has cooled, it will be switched back on, again automatically. The conductivity parameters of the plastic used to manufacture the housing have been carefully chosen so that fish or humans do not get burnt if their skin comes in contact with the surface of a working heater (the surface of the housing will immediately cool down when touched). 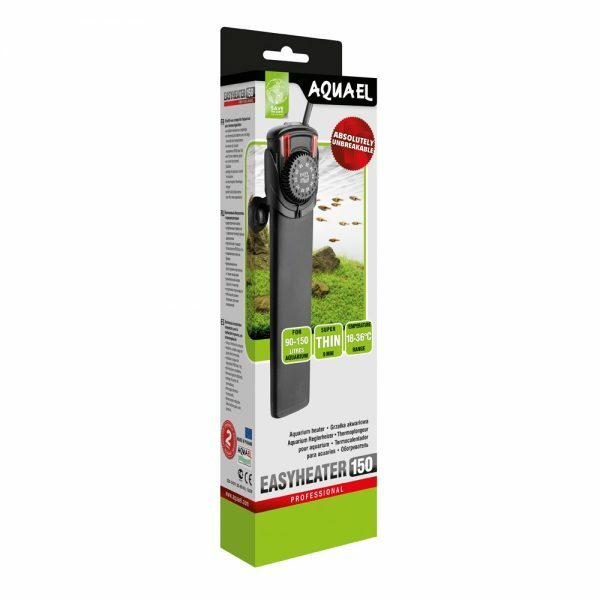 Thanks to its advanced design, the EASYHEATER make of aquarium water heaters guarantees an exceptionally high level of operational safety. Power: UK Plug.